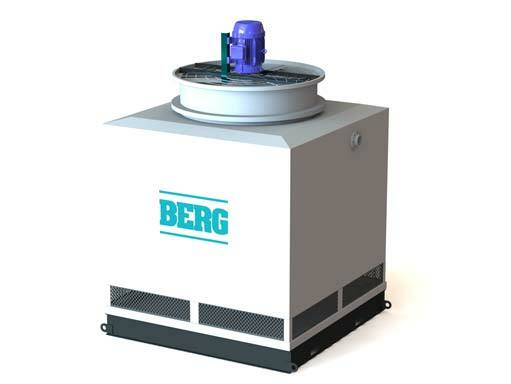 Outdoor Air Cooled Chillers | Berg Chilling Systems Inc.
Berg industrial outdoor air cooled chillers are used to conserve plant floor space by enabling the cooling system to be placed outside, either beside the building or on the roof. 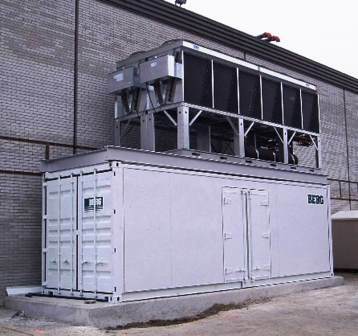 A fully weather-proof enclosure is used to protect the compressor and the NEMA 4 control panel enclosure. 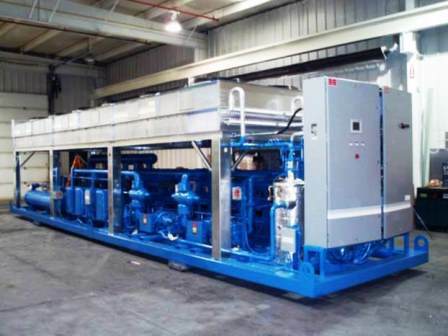 These industrial process cooling systems come pre-piped and prewired and require a minimum of installation effort. 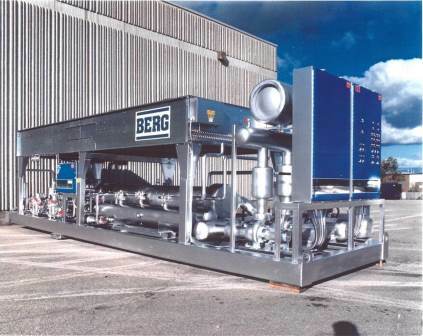 These industrial refrigeration units are used in conjunction with the Berg Pump Tank Assembly to create a Central Chilled Water System. 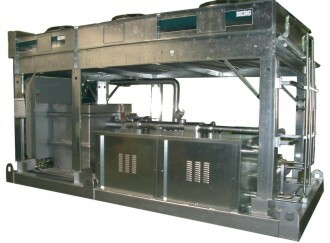 Vapor-compression refrigeration is one of the many refrigeration cycles available for use. Used in commercial refrigerators, large-scale warehouses for storage of foods and meats and a host of other commercial and industrial services. 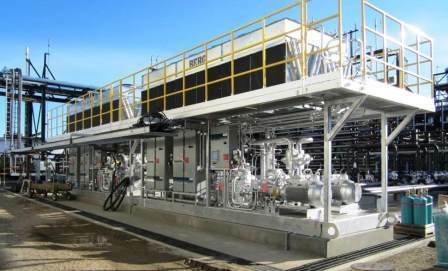 Oil refineries, petrochemical and chemical processing plants, and natural gas processing plants are among the many types of industrial plants that often utilize large vapor-compression refrigeration systems. 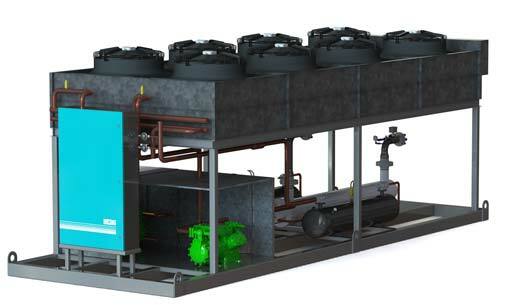 The vapor-compression industrial refrigeration system uses a circulating liquid refrigerant as the medium which absorbs and removes heat from the space to be cooled and subsequently rejects that heat elsewhere. 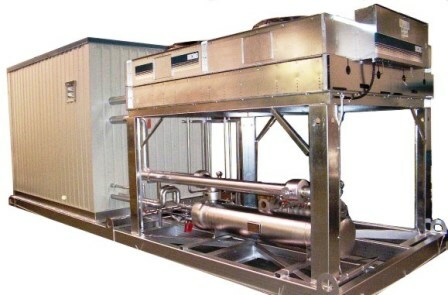 All industrial process chilling systems have four components: a compressor, a condenser, an expansion valve (also called a throttle valve), and an evaporator. Circulating refrigerant enters the compressor in the thermodynamic state known as a saturated vapor and is compressed to a higher pressure, resulting in a higher temperature as well. The hot, compressed vapor is then in the thermodynamic state known as a superheated vapor and it is at temperature and pressure at which it can be condensed with typically available cooling water or cooling air. That hot vapor is routed through a condenser where it is cooled and condensed into a liquid by flowing through a coil or tubes with cool water or cool air flowing across the coil or tubes. This is where the circulating refrigerant rejects heat from the system and the rejected heat is carried away by the air. To protect the chiller from inclement weather, the outdoor chiller may be installed in a pre-fabricated, insulated walk-in enclosure. Condenser and water piping to be heat traced for freeze protection.